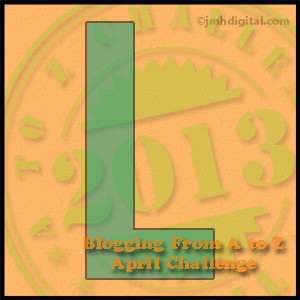 This is the twelfth post in the April A-Z Challenge and also in response to the prompt for Sepia Saturday #172. I am posting about a long ago march held in Detroit in 1942. I remembered this photograph in my Cleage family collection after seeing the post on Tony Zimnoch’s blog, The Last Living Rose, which he did in response to Sepia Saturday and the death of Margaret Thatcher. There is no information written on the photo about when or where it was taken. When I first looked at this photo, I thought that the signs were saying house war workers, as in people who worked in the house. I soon realized the march was about housing for war workers, after reading several articles about the housing shortage in Detroit during World II. 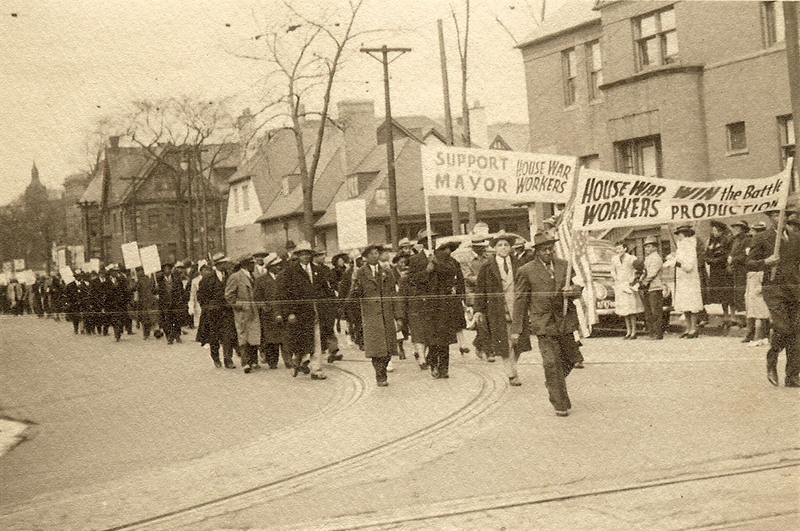 March in Detroit in support of housing black workers in the newly built Sojourner Truth Homes during WW 2. When thousands of Southern workers, black and white, flooded into Detroit to take jobs in the auto industry, they found a city with both highly segregated housing and a lack of housing. Most African Americans were crowded into a 30 block area, with inadequate housing, and rates of pneumonia and tuberculous that were much higher than those for whites. In 1941, the Federal Housing Commission authorized the building of a housing development for black workers. It was to be called the Sojourner Truth Homes after the abolitionist and former slave, Sojourner Truth. They decided to place it in a white neighborhood. The residents were not happy. They were even angrier when they found that the FHA would no longer guarantee loans to houses near the Sojourner Homes. 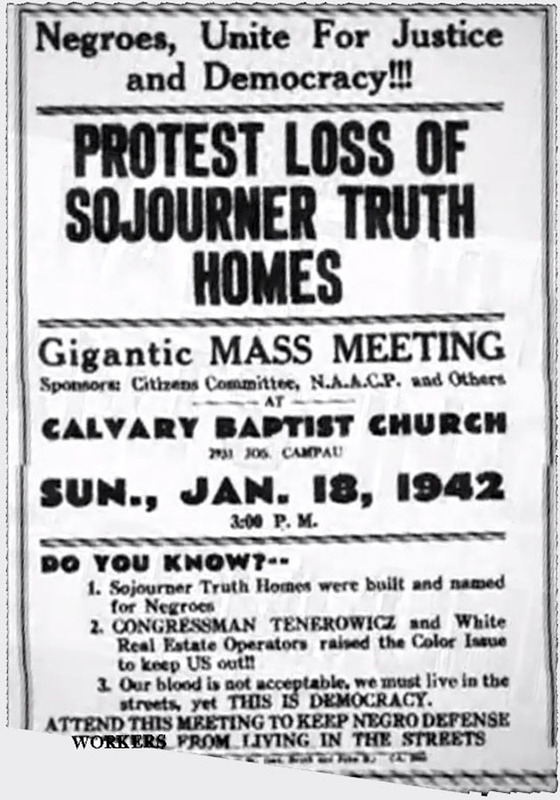 White reaction caused the Federal Housing Commission to change it’s mind and announce Sojourner Homes would be a white housing project. The idea of an integrated project never entered anyone’s mind, as far as I can tell. Detroit Mayor Jefferies spoke out on the side of keeping the project black. That is why, in the march above, banners say, “Support the Mayor”. 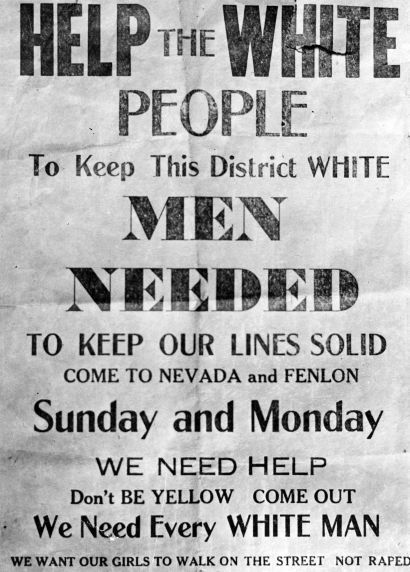 In January, after the housing was completed and black families were preparing to move in, over 700 white men turned out to bar the way. They blocked cars, they stoned vehicles and they refused to let the people move in. The police were unable or unwilling to stop it. Meanwhile, back in the black community, word came and black men came to support the people moving in. A riot ensued and over 200 people were arrested, almost all of them black, although the violence had largely been on the white side. In February, 1942 Federal troops were called out to make sure black residents were able to move in. Eventually 168 black families lived there. The violence was over for the time being. Flyer to protest the decision to make the Sojourner Truth Homes for white workers and exclude black workers. A flyer asking white men to come out and keep black people from moving into the Sojourner Truth Homes. From Life Magazine – March 16, 1942. A short video about the Sojourner Truth Homes Riot. 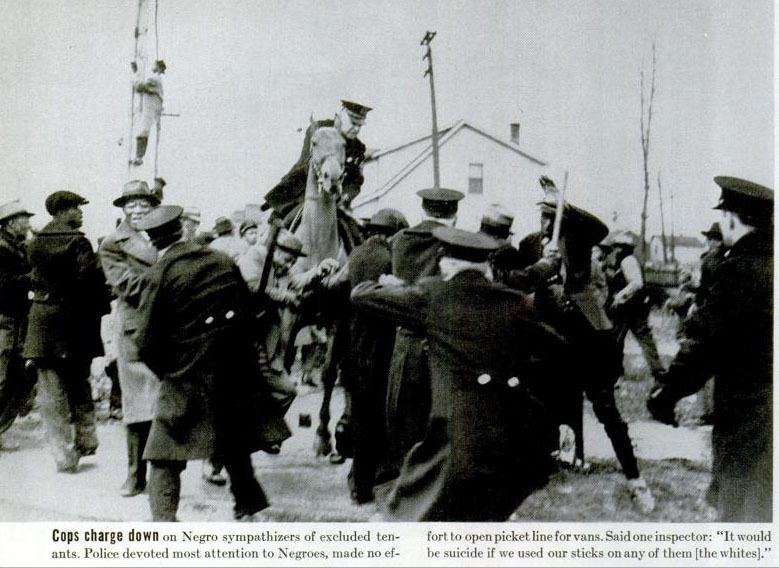 A pretty horrifying article, with photographs, from Life Magazine, March 16, 1942 – Detroit has a race riot as whites bar negroes from new homes in u.s. housing unit You can enlarge the article by clicking on the enlarge icon. Short History (2) – a more recent recounting of the history surrounding the riot. To see other Sepia Saturday Posts – CLICK. Whew, what a mess. There obviously was a need for more housing–and it is sad that things went so awry. That’s what happens when times are tough and racism doesn’t take a holiday. Oh my, some of those photographs remind me of photos taken in the Deep South during the 1960s. I am proud of the black men who supported the people moving into the housing project. Housing segregation still exists. The pictures sure do look like they could have been taken during the 1960s in (name your spot) southern US. Me too and yes, it does. Thank You Kristin.A Timely post.I was unaware. &,I’m sure, so are many Americans .It’s important to preserve peoples struggles. Several echoes with the British situation at the moment. Politicians are anxious to seize the narrative. To scrub out alternative histories. One of the current problems in Britain is the Conservative government’s “Bedroom Tax” Housing Rights are fundamental:& often have to be fought for….. Thanks for writing this post.It’s a good corrective to the common misconception (in England,at least) that formal discrimination was confined to The South States. I’ve been listening to the BBC recently, until it seemed to go off of the air yesterday, and have been hearing about the “Bedroom Tax”. That misconception is common even in the Northern United States. Detroit was, and may still be, one of the most segregated cities in the USA. A fascinating post on an important aspect of history I knew nothing about. Thank you for sharing it. I didn’t know that much about it myself until I started reading, trying to place the photo in some historical context. Kristin, what a great job you did on this very interesting article. Things like this have always made me so upset; the injustice, unfairness and sometimes violence that racism brings along with it. Thank you for posting this; it’s the kind of thing that should never be covered up. I’m sure I’m not the only one shocked by the tone of those flyers. Years ago I lived in Savannah in a house that was built for WW2 shipyard workers. When the US entered the war, housing became a big problem for industries all across the country. But these countless new social and civic dynamics created unexpected pressures that brought out the worst in people. And also the best too. The men and women in your photo had real courage and solidarity to march for a cause. All powerful images. Were members of your family in Detroit at the time? Do you think one of them took the picture? Yes, my family was in Detroit. Since I found this in my Cleage photos it would have been my father or one of his brothers. My father was in the Seminary in Ohio. My Uncle Louis was doing his medical internship in St. Louis. I’m not sure if Hugh and Henry were on the farm yet. One of them could have been home for the weekend. I just don’t know which one took it, but definitely one of them. It’s on printed on heavy paper as are some other family photos taken around this time. What an awful reaction by the police, and even worse the words used to justify their actions. And said to a national magazine as though they made sense. or in your country at all!! Prejudice is something I can’t stand. There’s good and bad in every race. What started out as such a happy day for people moving into their new homes ending so disastrously for them – your article, photos and video brought that out loud and clear. In the race riot that hit Detroit the next year, there were cases of white people stopping the other white people who were trying to drag black men off of the street cars to beat them and there were cases of white policemen rescuing black people. With photos of such. But in this case, I didn’t read or see any thing like that. That’s heartening to know. Hopefully, as the years go by more of us feel that co-existing makes life more interesting and what a brouhaha our ancestors made over nothing.